The Miners won their first game since 2016, but Dana Dimel still faces a major roster rebuild. UTEP football knew the past season would be a rebuilding year coming off a devastating 0-12 season in 2017. But still, little prepares a fan base to watch a 1-11 squad. The Miners have now lost 23 of their last 24 games. 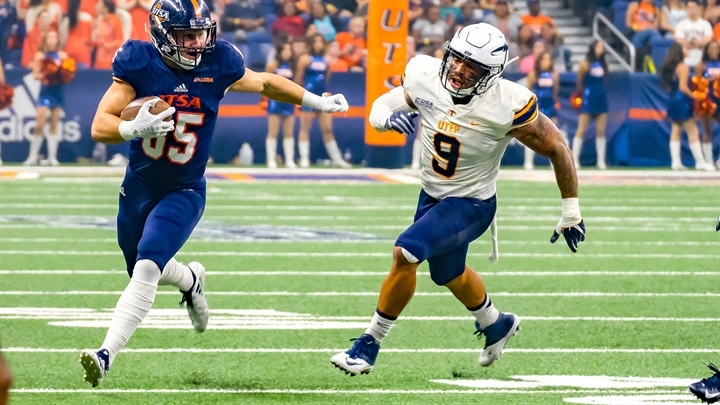 Before the Rice game on Nov. 3, 2018, the Miners had not won a game since the 2016 season. Head coach Dana Dimel showed some signs in his first season in El Paso, but there’s still a tremendous amount of work to do. Here’s our full postmortem and review of the 2018 UTEP Miners football season. There weren’t many bright spots on the UTEP offense, but junior running back Quardraiz Wadley was by far the most consistent contributor. Wadley rushed for 90 or more yards four times and averaged 5.1 yards per carry. Wadley managed to be relatively consistent despite playing behind a mediocre offensive line and the coaching staff failing to give him steady touches. Linebacker A.J. Hotchkins transferred to UTEP from Oregon, and immediately became the best player on the field. The senior compiled a ridiculous 126 tackles, 10.5 tackles for loss, seven sacks and four quarterback hurries in a standout season. The Miners defense will miss him in 2019. Two years ago, UTEP posted one of the worst seasons by any program this decade. While Dimel came in as an offensive mind, the defense was the side that immediately saw some impressive improvement. The Miners ranked No. 107 in total defense and No. 118 in scoring defense in 2017. Immediately, UTEP jumped up to No. 68 in total defense and No. 99 in scoring defense in Dimel’s first season. Over a six-game stretch in the middle of the year, the defense was legitimately impressive. Between Sept. 15 and Nov. 3, the Miners allowed just 347 yards and 26.7 points per game. Projected out to a whole season, those numbers would be good enough for No. 30 and No. 62 nationally. 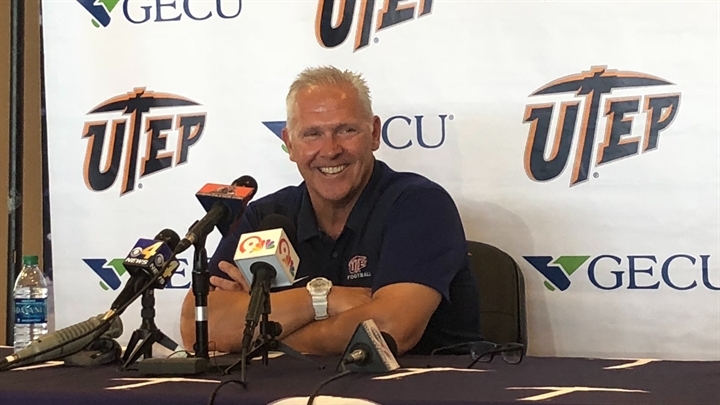 UTEP has to replace several key defenders from the 2018 squad. But still, it’s encouraging to see the Miners build a defensive culture right away. It would be easy to say that beating Rice was the best moment of the season, but that’s too reductive. Competing with North Texas, one of the best teams in Conference-USA, helped set the tone for major improvements throughout the season. UNT took a 20-10 lead in the third quarter, which seemed to put the game away. However, UTEP just kept fighting. Senior QB Ryan Metz ran for a touchdown and threw for a touchdown in the fourth quarter. UTEP got the ball back with 2:45 remaining down 27-24. Unfortunately, UNT got a stop. That performance helped set up an encouraging streak. The Miners stayed within a touchdown of Louisiana Tech and beat Rice in the next few weeks. The confident they gained from that UNT game can’t be oversold. Losing to Western Kentucky in this particular season isn’t ideal, but is perfectly defensible for a program that lost 21 of its previous 22 games. In a late season game, the Miners managed to make a loss to a comparable program completely embarrassing. The Hilltoppers scored 40 – 40! – unanswered points to open the game. In fact, WKU led 40-0 at halftime of this game. UTEP scored 16 points after that. Who cares. Western Kentucky scored more than 30 total points only two other times during a 3-9 season. Giving up 40 before the half was unacceptable. UTEP competed in several games this season, despite a 1-11 record. Between Sept. 22 and Nov. 3, the Miners lost just one game by more than 10 points. That one loss was against C-USA champion UAB. Just competing against WKU would have been enough to build some momentum. Instead, the Miners lost their final two games of the year by a combined 79-23. Biggest offseason question: Can Dana Dimel build the roster? UTEP’s roster was recruited to play in a pro-style system by former head coach Sean Kugler. When Dana Dimel came in, he expressed the need to rebuild it as more of a spread rushing offense. That process has been inconsistent to say the least. The Miners added a couple players as grad transfers for 2018, but still is struggling to produce quality depth. At this point, UTEP only has eight commits in the class of 2019, and none are confirmed as signed. North Shore wide receiver Ajani Carter became the latest to decommit just last night. Selling recruits on El Paso isn’t easy. The city is phenomenal, but it’s hard just to get recruits to visit. It doesn’t help that Dimel spent the bulk of his career at Kansas State, a school that managed to succeed despite horrible recruiting. The Wildcats got around those concerns by mining untapped Kansas high schools and the Kansas JUCO circuit; Dimel has to find his workaround too. Dimel wasn’t an especially inspiring hire. He spent three bad years at Houston in the early 2000s, and stuck around as Kansas State’s program plateaued and faded under Bill Snyder. It didn’t help that he took over one of the most difficult and unique jobs in the nation. There were clearly encouraging signs in Dimel’s first season, and perhaps even a few more than we expected. The roster was uninspired and the offense was devastated. But still, an improved defense helped muddy up games and give the Miners a chance. That’s something to build on. But still, UTEP is at a crossroads. The recruiting is an issue with only a few weeks left until national signing day. Wadley is the closest thing to a proven commodity on offense, and the staff still seemed hesitant to use him. The 2018 season was always going to be a “Year Zero” for this program after the relative roster mess Sean Kugler left behind. Dimel is now tasked with building from the ashes.